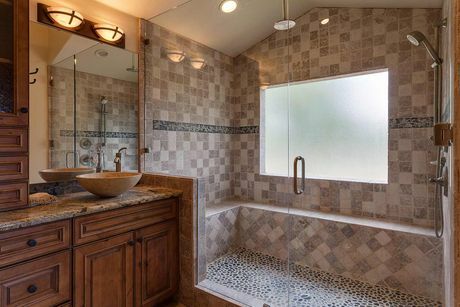 When you’re selling your home in Truckee, the condition of the bathroom will play a large part in your success. Because the bathroom is one of the two most used rooms in any homes, buyers give bathrooms a lot of attention. The way yours looks could be the deciding factor when buyers are wavering between your home and another. So what can you do to give your bathroom greater appeal? The first and most obvious fix is to scrub everything until it sparkles. If you have discolored tile grout, bleach it or stain it darker. If you have worn caulking, dig it out and replace it with fresh caulking. What if you have tile in an out-dated color? Replacing it can be expensive, so instead, work with it. Repaint the walls in a neutral that will complement the color of the tile. Gray is one of the “new neutrals” so choose a shade that blends well with the tile. Consider painting the cabinets a slightly darker shade of the same color for a cohesive look. Then choose a shower curtain, towels, and floor mat that bring in both the color of the walls and the tile. Even if you aren’t trying to coordinate with tile, replacing these items is an inexpensive, easy way to tie everything together and update the look. What else can you do inexpensively? Replace outdated or worn cabinet pulls. Look at your lighting. Is it dated? If so, home improvement stores have a wide variety of fixtures for under $100 that would give the room a whole new look. If you want to spend a little more, take a look at the medicine cabinet – if it looks well-used, consider replacing it with a bright new one. A note about painting… While sage green is one of the in colors for 2015, avoid using it in the bathroom. Try to go with a peach or rose tint, even when using gray or off-white. Why? Because people examine their looks in the bathroom mirror. Green can give an unhealthy cast to skin tones, while peach, rose, or even a warm beige will make faces look more vibrant. When you’re thinking of selling your Truckee home, get in touch. I’ll be happy to share other inexpensive tips for giving your home an edge over the competition.